More than half the adult population were online political users in the 2008 election. Three-quarters (74%) of internet users went online during the 2008 election to take part in, or get news and information about the 2008 campaign. This represents 55% of the entire adult population, and marks the first time the Pew Internet & American Life Project has found that more than half the voting-age population used the internet to connect to the political process during an election cycle. Going online for news about politics or the campaign. Fully 60% of internet users did this in 2008. Communicating with others about politics using the internet. Some 38% of internet users talked about politics online with others over the course of the campaign. Sharing or receiving campaign information using specific tools, such as email, instant messaging, text messages or Twitter. Fully 59% of internet users used one or more of these tools to send or receive political messages. If a respondent answered “yes” to any of the above questions, s/he was included in the overall population of people we counted as online political users in 2008. Of course, many respondents said “yes” to several of the online activities, but they were only counted once as a member of the online political user group. This post-election survey finding comes after a similar poll in the spring of 2008. 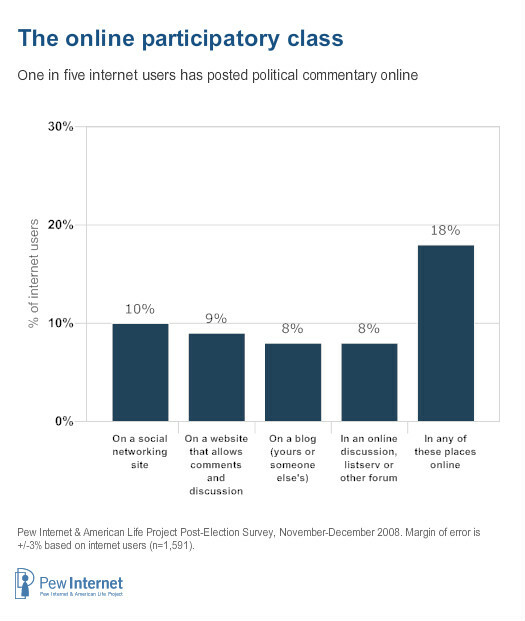 At that time, our survey found than 46% of Americans were online political users. In 2004, using a somewhat different set of metrics to define online political users, we found that they comprised 37% of the adult population. As the online political news audience has grown, the importance of the internet has increased relative to other news sources. 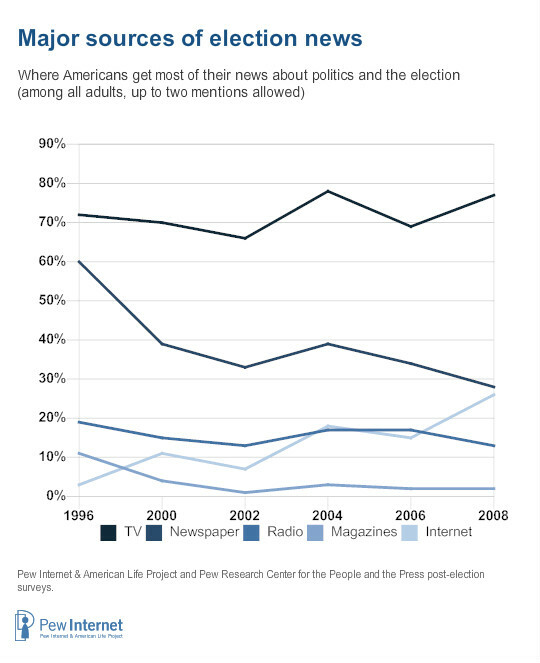 Six in ten internet users went online for news or information about politics in 2008. This represents 44% of all American adults. Nearly one-fifth of the online population got political news on a daily basis during the campaign, as 12% of internet users said they got political news every day and 7% said they did so multiple times over the course of typical day. All told, the overall size of the political news audience has more than doubled since the 2000 elections. As the overall size of the online political news audience has grown, the internet has taken a front-and-center role within the media environment. Among the entire population, the internet is now on par with newspapers as a major source of campaign news—26% of all adults get most of their election news from the internet, compared with the 28% who get their election news from newspapers—although television remains the dominant source of political news in this country. For internet users and those under the age of 50, the internet plays an even more central role. Fully 35% of those who use the internet get most of their election news online (compared with 25% who point to newspapers), while 34% of both 18-29 year olds and 30-49 year olds rely on the internet, compared with the 20% of those in each age group who rely on newspapers as a major source of campaign news. This trend is even more pronounced among those internet users with a broadband connection at home. They are twice as likely to use the internet as they are newspapers to get political news. 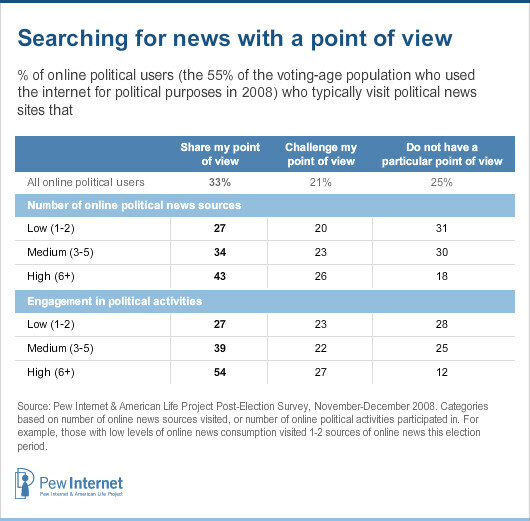 Politically-active internet users are moving away from news sites with no point of view to sites that match their political views, and this is especially true among younger voters. Fully a third of online political users (33%) now say that when they get online political information most of the sites they visit share their point of view – up from 26% who said that in 2004. This rise in partisan information-seeking matches a decline in the number of online political users who say most of the sites they visit do not have a particular point of view. In 2004, 32% of online political users said most of the sites they visited had no particular point of view and that percentage dropped to 25% in 2008. There was no difference between 2004 and 2008 in the number of online political users who said most of the sites they visit challenge their point of view. Both Democrats and Republicans are now more likely to gravitate towards online sites with an explicitly partisan slant than they were in 2004. Fully 44% of Democratic online political users (up from 34% in 2004) and 35% of Republican online political users (up from 26% in 2006) now say that they mostly visit sites that share their political point of view. However, the biggest change between elections occurred among the young. In 2004, 22% of online political users ages 18-24 said most of the sites they visit shared their views. 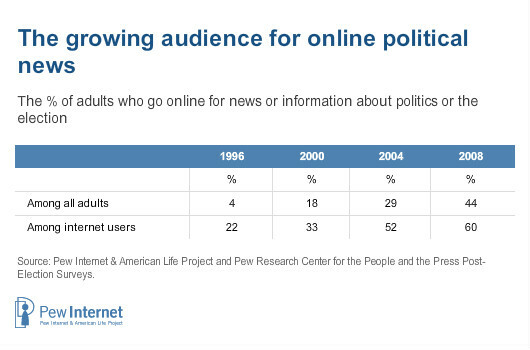 That doubled to 43% of online political users in that age range in 2008. Those who are most information hungry are the most likely to browse sites that match their views. Politically interested internet users have access to a wealth of political content online, along with new tools for finding, customizing and filtering highly targeted political commentary. As a result they are delving more deeply into the “long tail” of online political content, where they frequently seek out information that carries a distinct partisan slant and comes from sources beyond traditional news content. In this survey, we asked online political users whether they got political news or information from thirteen specific online sources. Although the most commonly mentioned sources of online political news are traditional media sites, online news consumers also sought out a wide range of non-traditional content—from portal news sites to user-generated content such as blogs and commentary sites. In total, nearly half of online news consumers accessed five or more different online types of news content in 2008. This greater involvement with the online political debate seems to change some users’ relationship to news content. As online political users get deeper into the world of online politics (whether by visiting a wider range of news sources or taking part in a wider range of political activities) they exhibit a pronounced shift towards news with an explicitly partisan slant. 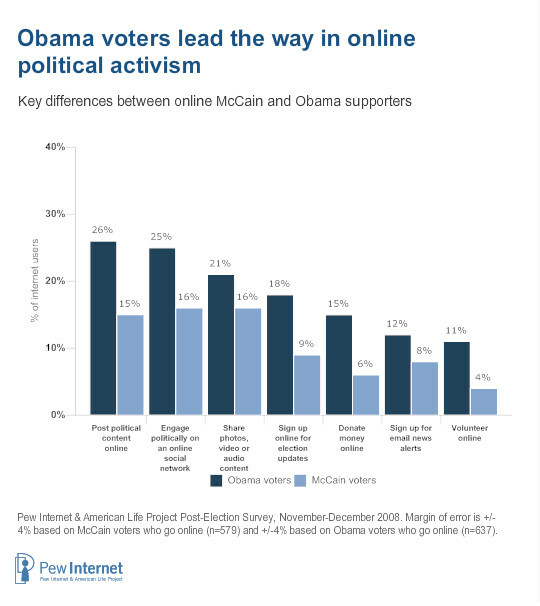 Obama voters took a leading role engaging in online political activism this election cycle. Supporters of Republican presidential candidate John McCain were more likely than backers of Barack Obama to be internet users (83% vs. 76%). This reflects the fact that McCain supporters and Republicans in general have higher amounts of education and income than Democrats – and those are two of the strongest predictors of internet use. However, online Obama supporters took part in a wider range of online political activities—from posting their own thoughts and comments about the election online to going online to volunteer for campaign activities or donate money. 49% of Obama voters shared text messages related to the campaign with others; 29% of McCain voters did so. 17% of Obama supporters and 7% of McCain supporters got text messages directly from a candidate or party. When these two activities are taken together, 22% of all Obama voters (text messaging users and non-users alike) communicated with others about the campaign or got information directly from a campaign or party on their cell phone, compared with 14% of McCain voters. Nearly one in five internet users belongs to the online political participatory class. Voters are increasingly taking an active role in the political process by contributing their own thoughts or comments to the online debate. In 2008, nearly one in five internet users posted their thoughts, comments or questions about the campaign on a website, blog, social networking site or other online forum. This online participatory class is composed largely of politically active young adults—fully 30% of those who post political content online are under the age of 25, and more than half are younger than 35. Political content creation is also tightly linked with the use of social media platforms such as online social networks, video sharing sites, blogs and status update services such as Twitter. Young Americans engage most deeply in the online political process, but online political involvement is something all generations do to some extent. 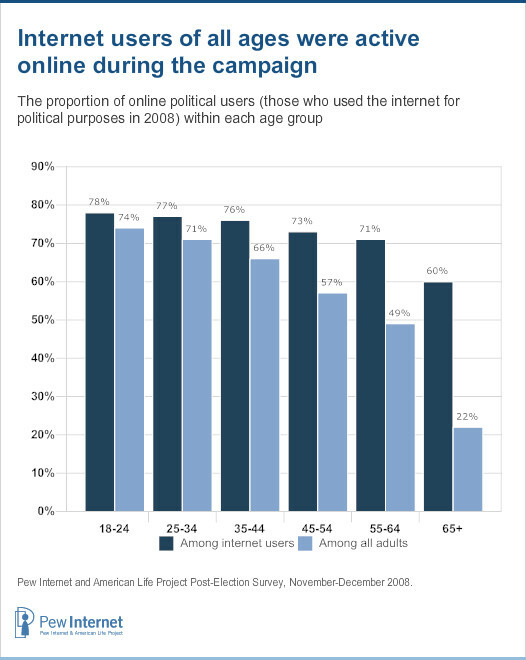 More than half of the internet users in every major age cohort took part in the political process in one way or another during the 2008 campaign. Indeed, the oldest Americans (those individuals age 65 and older) are the only age cohort for which substantially fewer than half of all members of that cohort are online political users. This is due to the relatively low levels of internet usage by seniors—although 60% of online seniors are online political users, just 37% of seniors use the internet. As a result, 22% of the entire senior population got engaged politically online in 2008. For other age groups (including those only slightly younger than 65) half or more of all adults took part in the online political process in 2008. Get customized political or campaign news (as through an RSS feed, automated email updates or a customized web page). Post their own original content online. Take part in political activities on social networking sites. 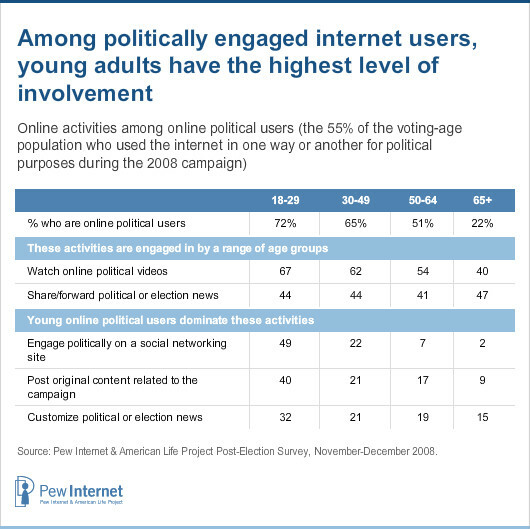 However, other online political activities are far from dominated by the youngest of online political users. While two-thirds of online political users under the age of 30 watch online political videos, this activity is relatively popular among other age groups as well. And online political users in all age groups are equally likely to share or forward interesting political nuggets to others. Indeed, older online political users are actually the group that is most likely to forward political content or commentary to others. Since seniors are regular users of email in other contexts (such as communicating with family members) it is a small leap for these individuals to share political content. Technology helped Americans to navigate the voting process and share their experiences at the polls. In addition to using technology to help make sense of the campaign, voters also went online to help prepare for Election Day and to share their experiences at the polls. Fully 26% of all wired voters used the internet to help them navigate the voting process, as one in five (18%) went online to find out where to vote; 16% did so for information about absentee or early voting; and one in ten (9%) went online to find out if they were registered to vote. Young voters and those who were politically involved online during the campaign were especially likely to turn to the internet for assistance with the voting process. Voters also jumped at the opportunity to share their experiences on Election Day with others, mainly in person and over the telephone but also using digital technologies such as email, text messaging and social networking sites. 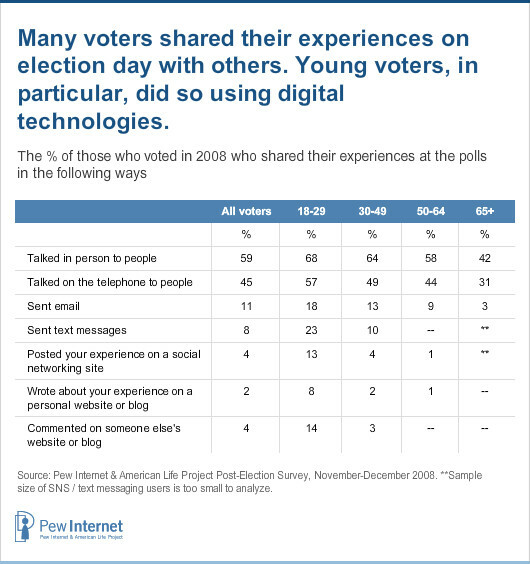 Again, young voters were especially likely to go online to share their voting day experiences relative to older voters. All these results come from a national telephone survey of 2,254 American adults between November 20 and December 4, 2008. Some 1,591 of them are internet users and 1,186 are those we call online political users. This sample was gathered entirely on landline phones. There was no extra sample of cell-phone users, who tend to be younger and slightly more likely to be internet users.